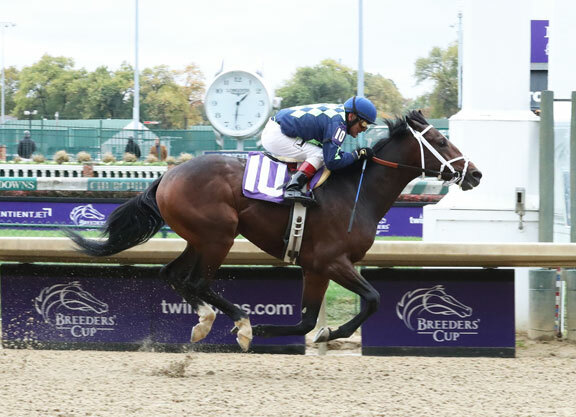 Perhaps under the radar in the hustle and bustle of Breeders’ Cup Friday was the maiden-breaking score by the 2-year-old Jack Van Berg (To Honor and Serve) in the second race on championship weekend. The colt is owned by Mike Waters’ Muddy Waters Stables and is trained by Tom Van Berg, son of the late Hall of Fame trainer for whom the horse is named. A lifelong racing fan, Waters has been a racehorse owner for just about five years now. He is in the commercial flooring business and is based in Seattle, where he hooked up with trainer Mike Puhich. It was Puhich who introduced Waters to Jack Van Berg. Waters and bloodstock agent Christina Jelm were shopping at last year’s Keeneland September Yearling Sale where they purchased a colt by To Honor and Serve for $28,000. Van Berg passed away two months later. His equine namesake made his first two racetrack appearances in stakes company at Emerald Downs for Puhich, including a runner-up effort in the W.T.B.O.A Lads S.
The 2-year-old colt joined the Churchill-based barn of Tom Van Berg in October and made his first start for the outfit last Friday. Let go at 14-1, the bay went wire-to-wire and scored by two lengths (video). The victory was part of a two-win day for Tom Van Berg, who came back to win the next race on the card with Casino Star (Flatter). With the maiden victory, Jack Van Berg may have earned himself a start in Churchill’s Stars of Tomorrow II card Nov. 24, but Waters said no definite decisions have been made. “We’ll let the horse tell us when he’s ready,” Waters, sounding like the late trainer he so admires, said.